Deleting alternate beacon definitions. The default beacon record cannot be deleted and should be used as your primary beacon. Note that all of these beacons will be transmitted with your station's callsign-SSID on the port(s) through which they are transmitted. 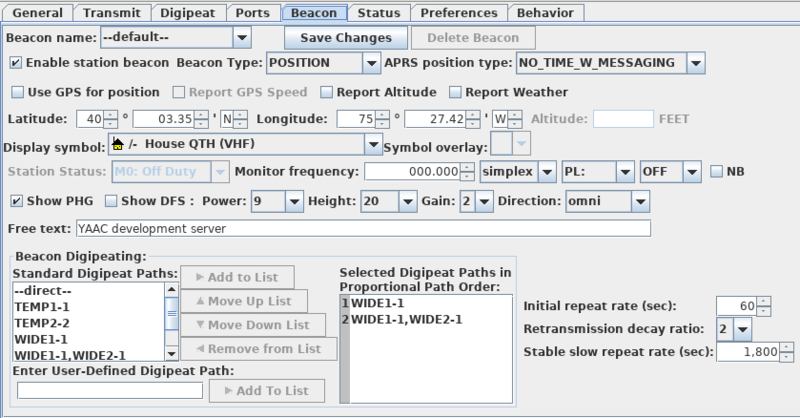 Each APRS-capable port allows you to select which beacon definitions will be sent through that port; it does not typically make sense to send more than one beacon through the same port. Enabling or disabling transmission of your beacon. Check the box to have your beacon be transmitted through all open ports that allow transmission. Whether to transmit APRS position reports using the ASCII real-time cleartext position message format ("! ", "=", "/" or "@" messages, APRS spec 1.01, section 8), the ASCII real-time compressed position message format (same prefixes, APRS spec 1.01, section 9), or the Mic-E binary format ("`" messages, APRS spec 1.01, section 10). the YAAC default, without an explicit timestamp but indicating that YAAC is capable of sending and receiving text messages. without an explicit timestamp, and claiming the station will not handle text messages (not actually true, but useful for certain applications such as the Duchifat-1 satellite or for unattended deployments). with an explicit timestamp, and announcing the station supports messaging. with an explicit timestamp, and announcing the station does not support messaging. Note that specifying that YAAC does not support messaging will not keep YAAC from acknowledging received messages, nor from responding to queries; in YAAC's case, it merely indicates that no human operator would be looking at the messages. Whether to use an attached GPS receiver for the position source, or use a fixed configured latitude/longitude. The fixed latitude, longitude, and (optional) altitude to use if the GPS receiver is not being used. Whether or not to append the GPS-reported speed and/or altitude to the beacon message. Whether or not to append weather station data to the beacon message. If both Report GPS and Report Weather are selected, the course and speed will be for the wind, not the station, but the altitude will still come from the GPS. The symbol to use to represent your station, and the overlay character to use for alternate-table symbols. The optional monitor frequency to be appended to the beacon message, with repeater offset direction and/or PL tone or digital code frequency, and whether narrowband FM is being used. This will restrict you to specifying amateur radio frequencies from the 6 meter band to higher frequencies only, as specified for your country (according to the locale on your computer in which you launched YAAC), or the ITU generic amateur frequencies if you are in a country whose more restrictive frequencies haven't yet been noted in YAAC. YAAC currently knows the frequency ranges as of 2017 for the United States, Canada, the United Kingdom, Australia, Germany, Switzerland, Belgium, and Luxembourg. The station status to be reported in Mic-E position reports. There are 15 possible statuses: "off duty", "en route", "in service", "returning", "committed", "special", "priority", 7 custom states, and the Emergency state. This has no effect if regular Position format is used; if you wish to send these status values in a clear-text position message, you must manually include the status name in the free-text comment, using all upper case surrounded by exclamation points with no embedded spaces (ex. : !ENROUTE! ). Whether to append RF transmitter Power/Height/Gain (PHG) or omni-DF (direction finding) information to the beacon message, and what the power (or received signal strength for DF), height, gain, and directionality of the station antenna are. Note PHG is meaningless for Internet-only or RF receive-only stations, and will be automatically suppressed, regardless of the enabling choice. It is assumed that omni-DF information will be manually updated as needed for the direction-finding operation. Any free text that should be appended to the beacon message. Which digipeat paths should be used for the beacon message. Several standard choices are provided (including the path of no digipeat aliases at all), but other custom paths may be entered in the User-Defined Digipeat Path text field. If more than one path is selected, they will be used alternately by the proportional pathing algorithm (each lower path used half as often as the path before it). What transmission intervals this beacon should be transmitted at. This overrides the application-wide defaults set on the configuration dialog's Transmit tab. Note that if a port the beacon is being transmitted through is using timeslotting, the transmit will not actually occur until the next timeslot after the scheduled beacon transmit time. None of these changes are activated until the Save Changes button is pushed.